Sarkheyli, Elnaz, Rafieian, Mojtaba. (1392). Assessing Tehran’s Urban Structure Effects on Non-Compliance with FAR Regulations. معماری و شهرسازی آرمان شهر, 6(10), 237-251. Elnaz Sarkheyli; Mojtaba Rafieian. 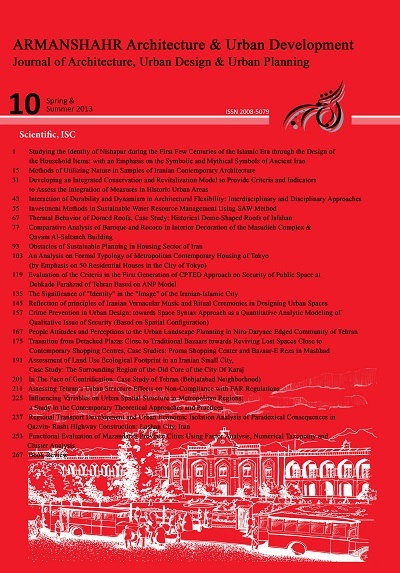 "Assessing Tehran’s Urban Structure Effects on Non-Compliance with FAR Regulations". معماری و شهرسازی آرمان شهر, 6, 10, 1392, 237-251. Sarkheyli, Elnaz, Rafieian, Mojtaba. (1392). 'Assessing Tehran’s Urban Structure Effects on Non-Compliance with FAR Regulations', معماری و شهرسازی آرمان شهر, 6(10), pp. 237-251. Sarkheyli, Elnaz, Rafieian, Mojtaba. Assessing Tehran’s Urban Structure Effects on Non-Compliance with FAR Regulations. معماری و شهرسازی آرمان شهر, 1392; 6(10): 237-251. 1Ph.D Candidate of Urban Planning, Faculty of Art, Tarbiat Modares University, Tehran, Iran. 2Associate Professor of Urban Planning, Faculty of Art, Tarbiat Modares University, Tehran, Iran. A100CTM.(2001). Building Contraventions in Tehran: Causes and characteristics, Shahrdariha, 33, 12–15. Aguilar, A., G. (2008). Peri-urbanization, illegal settlements and environmental impact in Mexico City, Cities, 25, 133–145. Allain, R. (2009). Urban Morphology, Geography, Spatial Planning and Urban Architecture (A. Sharifi, trans.). Tehran, Iran: Honar university. Alnsour, J., Meaton, J. (2009). Factors Affecting Compliance with Residential Standards in the City of Old Salt, Jordan. Habitat Int. 33, 301-309. Alexander, C. (2008). A pattern language: Towns and Building Construction (R. Karbalayi Nuri, trans.). Tehran, Iran: Center for Architectureal & Urban Studies and Research. Appiahence, J. (2002). Urban Crime Trends and Patterns in Ghana: The Case of Accra, Journal of Criminal Justice. 31, 13-23. Arimah, C. & Adeagbo, D. (2000). Compliance with Urban Development and Planning Regulations in Ibadan, Nigeria, Habitat Int. 24(3), 279-294. Azizi, M. (2002). The Role of Building Density in Urban Development, Tehran, Iran: presented in The First Construction Seminar in Capital,. Beheshtiravi, M. (1993). Assessing the Physical Effects of Building Contravention on Cities, case study: Tehran, Unpublished master’s thesis, Tehran: Faculty of Fine Arts, University of Tehran. Diargah Architectural and Urban Planning Consultant Firm (2010). The revision and modification of the process of building contraventions’ control in Tehran, Tehran, Iran: Planning and architecture department of Tehran municipality. Fekade, W. (2000). Deficits of Formal Urban Land Management and Informal Responses Under Rapid Urban Growth: an international perspective, Habitat Int., 24(2), 127-150. Few, R., Gouveia, N., Mathee, T., Harpham, A., Cohn, A. & Swart, A. (2004). Informal subdivision of residential and commercial buildings in Sao Paulo and Johannesburg: living conditions and policy implications, Habitat Int., 30(1), 427-442. Hamshahri daily magazine (2003). Ten years of density selling, 11th year (3173), <http://hamshahrionline.ir/ hamnews/1382/820630/econom/maskan.htm>,Retrived January 2011. Huchzermeyer, M. (2004). From “Contravention of Laws” to “lack of rights”: redefining the problem of informal settlements in South Africa, Habitat Int. 28, 333- 347. Ioannidis, Ch., Psaltis, Ch. & Potsiou, Ch. (2009). Towards a Strategy for Control of Suburban Informal Buildings Through Automatic Change Detection, Computers, Environment and Urban Systems, 33, 64-74. Kahraman, S, Saati, A. & Misir, S. (2009). Effects of Adding Illegal Storeys to Structural Systems, Sâdhanâ. 31(2) 515-526. < www.ias.ac.in/sadhana > Retrieved October 2009. Kamyar, Gh. (2008). Urban Legal and Urban Planning, (3rd edition). Tehran, Iran: Majd Scientific and Cultural Assembly. Madanipour, A. (2002). Tehran, Emergence of a Metropolitan (H. Zaravand,trans). Tehran, Iran: Pardazesh va Barnamerizi Shahri Firm. Ogu, V. (1999). Housing Enablement in a Developing World City: the case study of Benin city, Nigeria, Habitat Int. 23(2), 231-248. Rahnama, M. & Abbaszadeh, G. (2008). Fundamental and Models of Urban Form Measuring, Mashhad, Iran: Jahad Daneshgahi. Sarkheyli, E., Sharifi, A., Rafieian, M., Bemanian, M. & Murayama, A. (2011). An Investigation of the Reasons for Non-compliance with FAR Regulations in Tehran, Cities, 29 (4), 223-233. Sarkheyli, E. (2010). An Exploration of Influence of Tehran’s Spatial Structure on Occurrence of Building Contraventions, Unpublished master’s thesis, Tehran, Iran: Tarbiat Modares University. Sarkheyli, E. & Rafieian, M. (2010). Pathology of Municipality of Tehran’s Revenues, Gained from Building Contraventions Fines, Tehran, Iran: Municipality Finance Conference. Shieh, E. (2010). The Harmony of Industry, Voice of the City, Tehran, Iran: University of Science and Technology. Sitte, C. (2009). Urban Structure According to Art Introduction (F. Gharib, trans.) (2nd edition). Tehran, Iran: University of Tehran Press. Taleghani, M. (1990). Sociological Studies in Tehran, Tehran, Iran: Tehran Institute of Cultural Studies, Tehran. Tavassoli, M. (2009). Urban design, the art of renewing urban structure with four case studies, Tehran, Iran: Khane Chap Va Tarh. Wang, X. & Hofe, R. von. (2007). Research methods in urban and regional planning. Springer. Winayanti, L. & Lang, H. C. (2004). Provision of Urban Services in an Informal Settlement: a case study of Kampung Penas Tanggul, Jakarta, Habitat Int. 28, 41-56. ZangiAbadi, A., Ghaedrahmati, S., Mohammadi, J. & Safayi, H. (2010). Spatial analysis of interaction between building violation and earthquake vulnerability in Isfahan, Modares Olum Ensani, Barnamerizi Va Amayeshe Faza, 14 (2), 1-21. Zegarac, Z. (1996). Illegal construction in Belgrade and prospects for urban development planning, Cities, 16(5), 365-370.